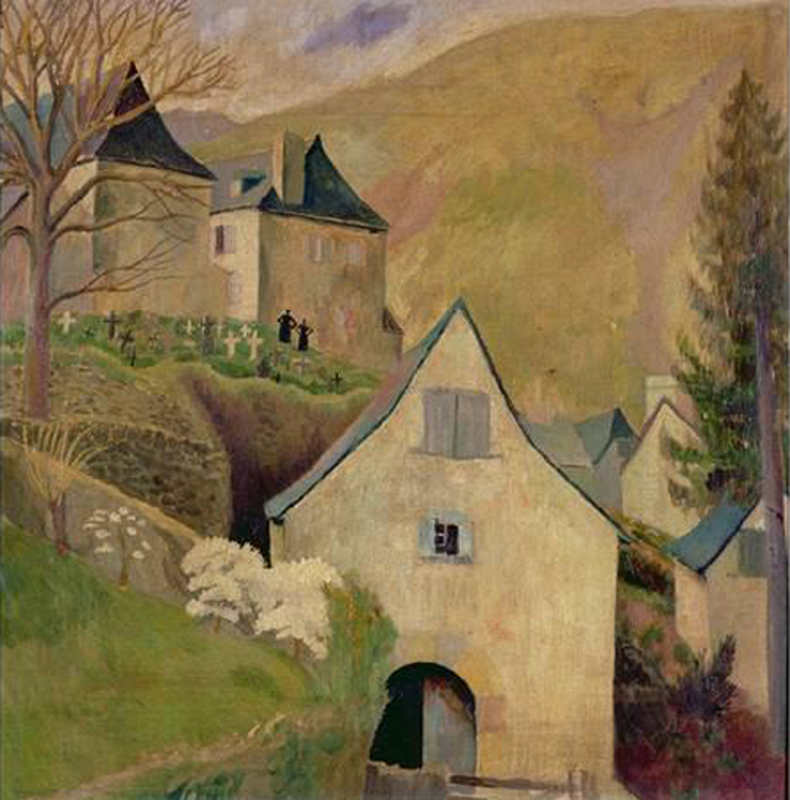 Dora Carrington, Mountain Church, Larrau. I am a believer in pilgrimage in a mediaeval sense. It functions to ground us in some way. We have unsettled souls; we are human beings, bound for mortality, wondering about eternity. There is a consolation in doing something that is a ritual—there have been many before us, many will come after us and we are part of something greater than ourselves, if only for a moment. MANY WRITERS HAVE extolled the virtues of embarking upon the Camino de Santiago or the Way of Saint James, serving as a pilgrimage to the shrine of the apostle, Saint James the Great, in the cathedral of Santiago de Compostela in Galicia in north-western Spain: Jennifer Lash’s On Pilgrimage charts her journey in the wake of a breast cancer diagnosis; Ernest Hemingway’s The Sun Also Rises depicts his bohemian experiences in the Camino Spanish town of Burguete; and Paulo Coelho’s The Pilgrimage, probably the most well known of all, is a dialogue with his guide, Petrus, who teaches him to understand the nature of truth through the simplicity of everyday life. Irish poet, Liam Ó Muirthile (1950–18th May 2018), a passionate Francophile, similarly walked his own Camino Francés, a total of 770 km, across the Pyrenees from Saint-Jean-Pied-de-Port in France to Santiago de Compostela in Spain, during the autumn of 2015. Travelling alone, carrying only a small backpack and staying in the pilgrim hostels en route, he recorded his experience both in prose—Oilithreach Pinn [Pen Pilgrim] written in Irish—and in poetry—Camino de Santiago, Dánta, Poems, Poemas composed in both Irish and English, together with translations in Spanish and Galician by Carme Rodríguez Alonso. The recollections of his spiritual peregrination form some of the most beautiful ever written. 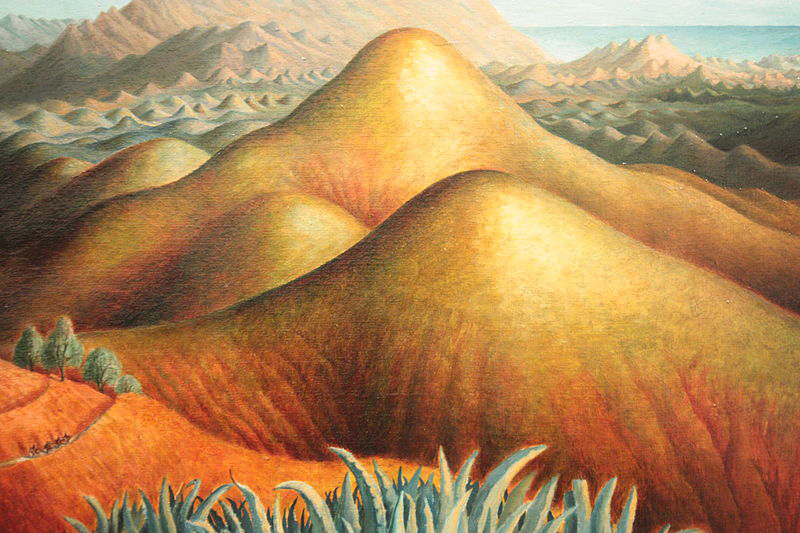 Dora Carrington, Spanish Landscape With Mountains. I wanted to write a collection of poems that came only from the rhythm of walking. I composed the poems in my head, which confined them … because you can’t do complex imagery in your head. There are no sub-clauses, conditional clauses or metaphors. It is all short lines. You can construct a poem any day of the week but if it doesn’t carry the sweat and dust and spit of the road, maybe it isn’t carrying that weight for you. The recipient of numerous awards, Liam Ó Muirthile was born in 1950 in Cork City, the first of nine children, where he learnt Irish at school and in which he would continue to compose his literary offerings throughout his writing life, as a poet, playwright, journalist and novelist. At university in the late sixties, he became associated with a group of poets who chose Irish as their creative medium and became collectively known as the Innti generation (literally “in her” and alluding to a dedicatory call to the feminine), taking inspiration from fellow Irish poet, Seán Ó Ríordáin, and Irish composer, Seán Ó Riada, as well as the Beat movement and American counterculture. that comes from all living colours. croí go héadrom ar do bhéal. de todos los colores bajo el cielo. 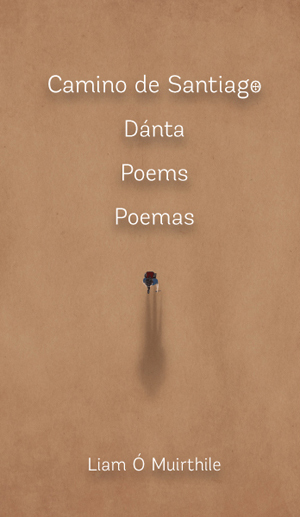 Camino de Santiago, Dánta, Poems, Poemas is an exquisite collection of verse. In the manner of the haiku, the exactitude of each chosen word and accompanying syntax distills the very essence of a moment, ordinarily well beyond recorded form. Indeed, the immediacy of everyday objects— “tin mug”, “scallop”, “gable stone” —are imbued with significance when suffused with the spirit of the Camino, each item representing a flash of creative inspiration and a filigree of emotion, both visceral and raw. 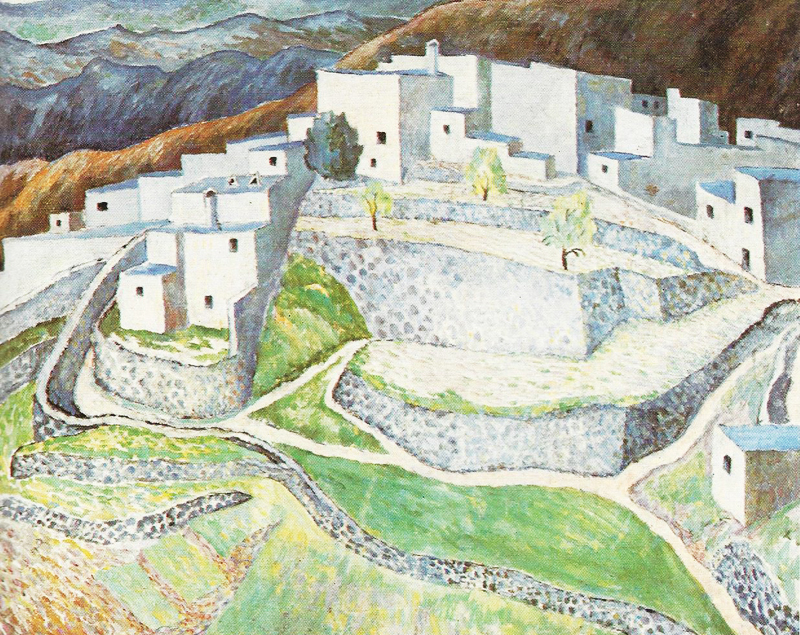 Dora Carrington, Hill Town in Andalusia. I was attracted to the idea of it [the Camino]—the distance, the journey, the historical significance, the metaphor of the journey itself. Any artist of any worth has undertaken a small-scale Camino—the only place you can find your art is in yourself. Neither maudlin nor sentimental, Camino de Santiago, Dánta, Poems, Poemas exudes the very suchness of life, elevating the seemingly sublunary into the sublime. Despite the relentless rhythm of the pilgrim’s footfalls, behind the poetic cadences lies the primordial essence of stillness, the unspoken sacrament of being, supporting and sustaining all of life, and unto which we must all irrevocably journey without end. as we walk to the same beat. mientras caminamos al mismo paso. Sadly, during my correspondence with the publisher, Cois Life, regarding writing a review of the Camino poems, Liam Ó Muirthile passed away. His life, he once said, “… has been a lifelong journey into language, as if that journey in itself discovered and uncovered the true self. That journey is effectively my poetry.” And what better way to crown his literary career with a collection of poems on the ultimate voyage of self-discovery into the very heart of his innermost being, immortalized in his beautiful verse and dedicated to otherness, as Krishnamurti would put it, guiding us eternally along the way.